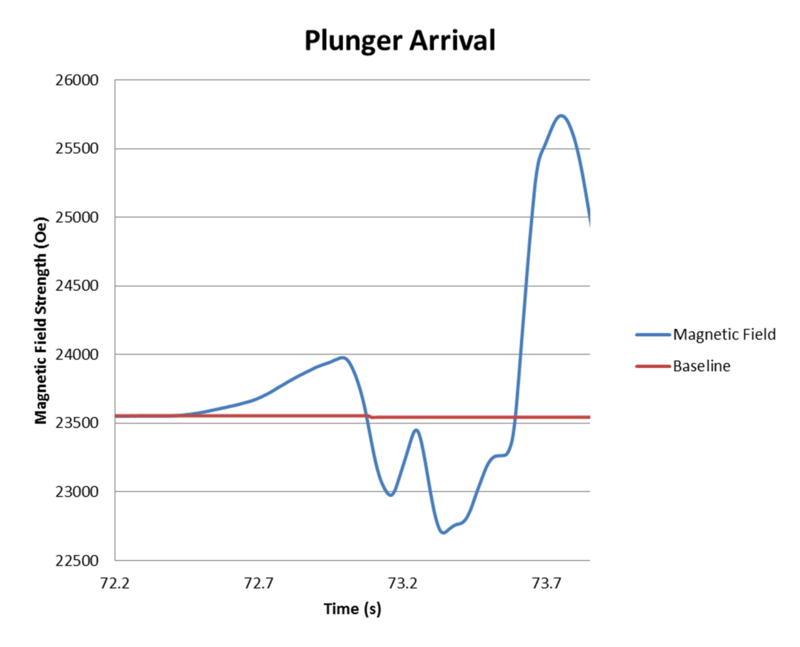 Quest for plunger surface velocity drives innovation in magnetic sensor - Extreme Telematics Corp.
Average plunger velocity historically has been calculated using the well depth and arrival time. This was used for both safety and optimization of plunger lift systems because it was the best we had. 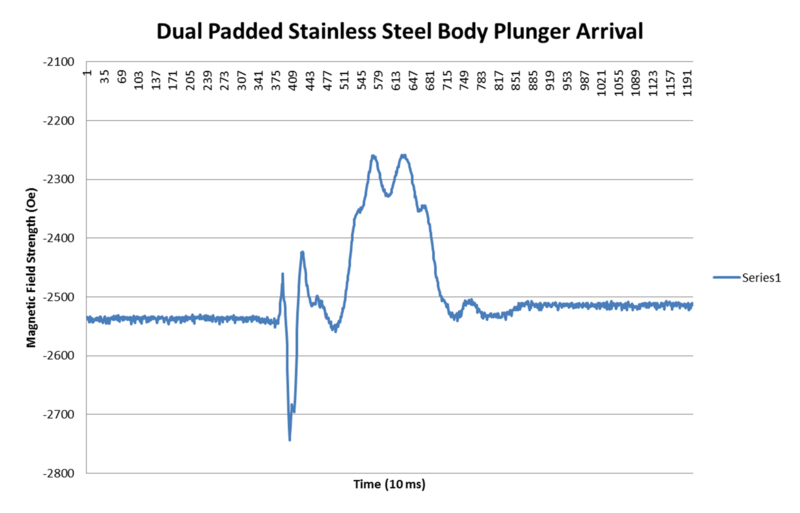 At ETC, we knew this was flawed because it did not account for the acceleration of the plunger that so often happens at surface. 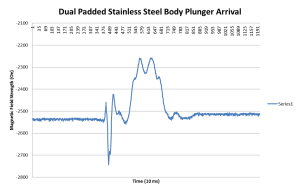 Unfortunately, the technology to measure plunger velocity didn’t exist and the plunger arrival sensors at the time were nowhere near reliable enough to be of any help. We decided we would change that. In 2010, the plunger arrival sensor consisted of a magnetic pickup, a piece of wire wound around a solid core. As a ferrous piece of metal passed by the coil, it would induce a current that was used to close a switch. The closing of the switch would allow some current to flow from the control system, alerting it that the plunger had arrived. While this helped, it certainly was not as reliable as it needed to be as the electromagnetic coil can often be susceptible to noise from other sources, especially lightning, leading to false detections. Conversely, a slow moving plunger could sneak by undetected because the current produced by the coil is related to the rate of change in the magnetic field. If the field changes too slowly, there isn’t enough current to close the switch. With this technology, we couldn’t reliably get a plunger arrival detection, let alone count on using two or more of them to detect the velocity of the plunger as it travelled by. 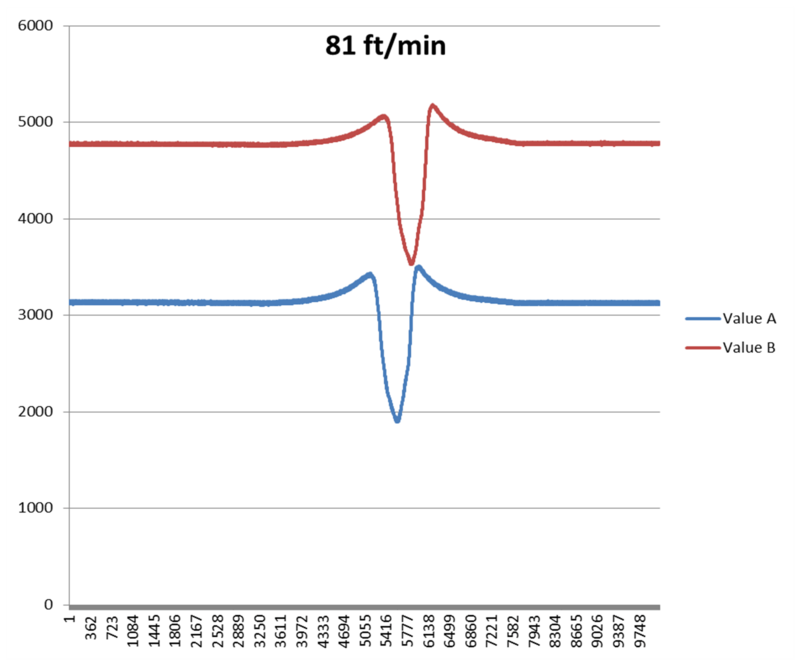 Even if we were able to get a reliable detection, we would then have to deal with errors introduced by different sensitivities (inconsistency in the winding of the wire), position error, and timing by the control system when reading the sensors. We knew that before we could tackle the issue of measuring surface velocity, we would first have to change the technology in the plunger arrival sensor. That is exactly what we did. 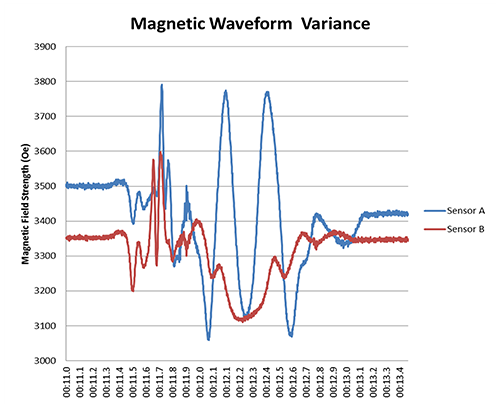 Instead of using an electromagnetic coil, we used a magnetic sensor that measured the magnetic field of the earth. 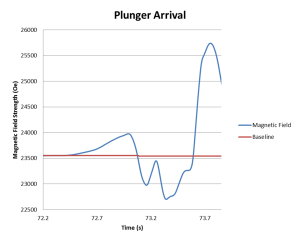 This gave us a picture of what a plunger arrival looked like in the magnetic domain, allowed us to filter out the noise, adjust the sensitivity, and make decisions on when the arrival exactly occurred. The Cyclops was the very first smart, magnetic eye for your plunger well. As we gathered data on various plunger types at various speeds, it became apparent how we would go about detecting the velocity. Even though each plunger produced a different signature, there were common similarities such as how the waveform would either move positively or negatively and would then reverse direction. As long as the well components did not change position much, the signal would return back to the baseline that it started at. 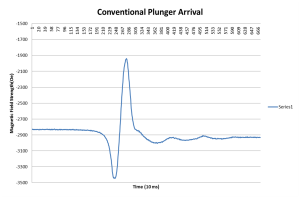 While we could have created a method to determine the velocity based on a single measurement point, it was likely that this would be inaccurate and may require more information about the plunger to give us a useable velocity. We decided that using multiple sensors spaced out would give us a better way to detect velocity regardless of the style of plunger. With two or more magnetic sensors on the same circuit board, we were able to eliminate timing errors, differences in sensitivity, variable outputs from individual sensors, and timing issues from a control system. We had raw waveforms at our disposal and could make split second calculations to produce an instantaneous velocity as the plunger passed by. While this may seem easy, it does get quite complicated when using more complex plungers. We had to devise a method that could take these more complex waveforms and pull out a reliable velocity. This led to our plunger velocity detection method that is currently patent pending. 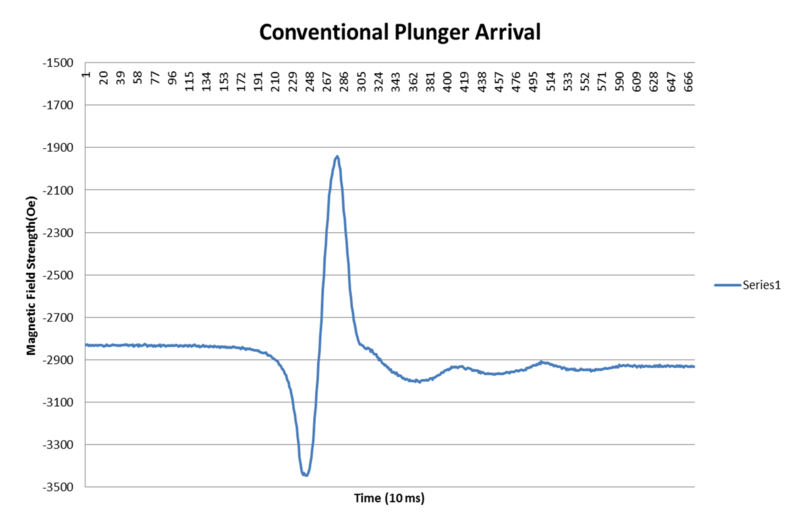 With an initial design, a repeatable method, and a pending patent, we were ready to move towards building a production sensor that would show us something that no other sensor could, the instantaneous surface velocity of a plunger. 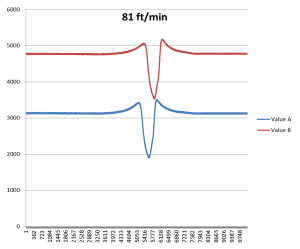 Surface velocity is one of the most important parameters when it comes to operating a plunger well and with the creation of Sasquatch it is finally available to well operators. Check back in the coming weeks for a new blog on the development of Sasquatch and the various testing that went into it.